Percentage increase in price level. When most prices grow, there is inflation, provided the other prices don't drop too heavily. If inflation is not compensated by nominal increases of income, people become poorer. High and variable inflation makes economic price forecasting more difficult and decision-making processes may be negatively affected. Extremely high inflation attracts too much daily attention from households and decision-makers, distracting them from more important tasks. 2. a price increase of a narrow group of goods or services to be rather considered as a change in relative prices between that group and the rest of the prices (the former get more expensive, the latter relatively cheaper). From an empirical point of view, this distinction is unpractical and not used: central statistical offices measure inflation in reference to some average of prices growth, irrespective of the abovementioned distinction. Incomes, wages and asset prices (like share quotations) are not included in the averaged "prices", thus inflation has important real effects (i.e. on quantities), to the extent it is not perfectly matched by soaring income and asset prices. Different types of inflations can have widely different determinants, effects and remedies. There is no strictly binding definition of ranges of intensity in price increase. Still, some indications can be given as it follows. Hyperinflation is the most extreme inflation phenomenon, with yearly price increases of three-digits percentage points and an explosive acceleration. Extremely high inflation could range anywhere between 50% and 100%. High inflation is a situation of price increase of, say, 30%-50% a year. Both kinds can be stable or dangerously accelerate to enter in an hyperinflation condition. Moderate inflation can be differently defined around the world, given the different inflation histories. As an indication only, one could consider an inflation as moderate when it ranges from 5% to 25-30%. For some countries, the higher part of this range is already "high inflation". Low inflation can be characterized from 1-2% to 5%. Around zero there is no inflation (price stability). Below zero, a country faces deflation. 3. external sources, as oil price increases or currency relative devaluation. A systematic institutional difference is between countries having or not having (partial or total) indexation of wages (and other income sources). Indexation makes inflation much less painful, but normally keeps it at a higher level and increases the risk of a continous acceleration. A widely dispersed price increase as it is, inflation is the immediate result of firms' decisions. These decisions may result from coordination and monopoly/oligopoly dynamics, as well as from the attempt to increase margins and profits. But there is no need for formal coordination: a favourable demand situation, with higher income and booming propensity to consumption, makes price increase easier. A generalized cost increase, as with wages, energy prices (especially oil prices), devaluation, and certain taxes, is clearly conducive to inflation. A mediation is given by productivity improvements, which reduce unitary costs of production. Conversely, extensive liberalizations in sectors where prices were rising can lead to a lower inflation rate, thanks to the new entrants and the tougher competition. Increases in minimum wages can be reflected in one-time increase of the price level, distributed over a time period, to the extent the workers paid at that level is a share of the total workforce and the total payroll is a share of total costs . 4. by how much to change the prices. When inflation is high, updates are frequent, involve most or every price, increases are large and no price is cut. Conversely, when inflation is near zero, updates are unfrequent, involve just a few prices, increases are small, and several prices are cut. In macroeconomic terms, large increases in money quantity, especially if clearly exceeding nominal GDP growth, risk to accelerate the current inflation rate. In other words, if present inflation plus real GDP growth is (much) less than money-quantity rate of growth, there is a consistent risk of acceleration, unless other factors push in the opposite direction. However, the statement that only money matters as for inflation would lead a monetary area sharing the same money quantity (so the same money quantity dynamics) to have the same inflation: this is false, as you can see from Euro-zone data such as these. Consequently, a variety of source of inflation (not just money) has to be accepted as a departing point for real-world analyses. A pro-inflation pressure may come also from fiscal deficit, with different dynamics depending on ways of financing it (bonds sold to the market or to the central bank, i.e. with a sharp increase of money quantity). An important determinant of inflation is given by expectations on future rate of inflation, to the extent they are widely accepted and exert influence on decision-making processes, as with long and medium-term wage contracts. Different social groups (such as workers and employers) have different inflation expectations and what will be incorporated into prices and wages will reflect their roles and balance of power. By anticipating a certain increase of price level, consumer might be prompt to purchase now to avoid the increase (so boosting demand and possibly provoking a rise in price, through a feedback dynamics of "self-fulfilling prophecy", whose exact dimensions are however erratic and unstable). By anticipating that competitors will raise their price, a firm is confermed in its intentions in doing the same, without risking to lose customers. Actual competitive outcomes, including surprises and unexpected losses of market share, shape judgement on past correctness of expectations and changes in the expectation formation processes. Oil price fluctuations exert a distictive important influence on inflation throughout the world. The increase abroad of prices for products that our country purchase, if not counteracted by a re-valuation of the currency, exerts a pressure on the price level, possibly inducing "imported inflation". Inflation in the country's trade partners then spread out and can feedback there. Another sector where there are wide fluctuation is agriculture: food prices are volatile, especially when a number of real world events are amplified by speculation. A relatively similar phenomenon relates to raw materials and industry inputs such as minerals. The attempt by statistical offices to ignore price movements in volatile sectors generates the computation of "core inflation". By contrast "headline" inflation is what the media report more often (being easier to communicate) and tend to influence the perception of inflation by the (media-exposed) population. In certain concentrated economies, where a relatively homogeneous business group can coordinate prices, inflation can be a joint response to rise in nominal wages, in order to contain real wages. Anti-inflationary policies would cooperate in generating enough unemployment to reduce the power of labour organization and widespread fear of poverty. In such economy, profits derive from low wages and tight working conditions, possibly directing sales to the thin upper echelon of income distribution or abroad (exports). In the latter case, the inflation should be counteracted by devaluation in the exchange rate to maintain international competitiveness. The amount of inflation is dependent also on the reaction of the central bank - it may be relatively lax and tolerate a moderate inflation or be tight, possibly reacting in advance to earliest signals and prodromes. The overall attitude of the population, business groups and trade unions to inflation influences top politicians and the central bank (which can be less or more independent and connect to the views and interests of different social groups). Similarly, a pressure on government to fix, cap or regulate prices and incomes could lead to some intervention. In other terms, inflation can be the result of a struggle for real income by competing social groups (with workers asking for higher wages, business for higher profits and foreigners for higher prices for their products, e.g. oil); in this perspective, a mediation of interests is key to tame inflation and the implementation of such policy requires growing trust across the business aisle and the change of business routines. Uncompensated inflation reduces incomes, thus consumption and savings, both in aggregate and with particular reference to certain social groups (e.g. the elderly, as surveyed here). Through a Keynesian multiplier, income and consumption will cumulatively fall further. In this graphical example, the poor has a (black) reserve price of 50 and before inflation can afford almost the majority of goods on that market. The rich has a (purple) reserve price and can afford almost all the goods. 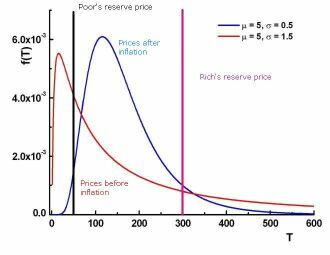 With inflation, the number of goods at the different prices (the Y axis) shifts (from the red to the blue curve), with the goods costing less than 50 becoming a small minority but with only a tiny shrinking of the affordable goods for the rich. 8. the rich is more likely to get revenue from commercial and non-working activities (such as dividends and interests from previous investments, resulting from savings and rents), which can raise more than the general level of prices (inflation-leaders). If inflation is mainy demand-pulled, it vanishes the increases in nominal effective demand and it frustrates consumption expectations. By contrast, if inflation is mainly due to efforts of increasing margins and profits, it is possible a rise in consumption in high-income groups. Investment should be discouraged by uncertainty about future engendered by inflation and its wide fluctuation. Still, to the extent that benefits of inflation are mainly reaped by domestic firms, the real interest rate for investment fall inversely with mounting inflation. Thus, a low or moderate inflation may help investments, at least to the extent they are actually influenced by real interest rates and until a central bank intervention. In fact, central banks can try to control the inflation rate through a sharp increase in real interest rates, more than proportionally reflected in nominal interest rates. This move usually provokes a fall in investment and a revaluation of currency. The first effect brakes domestic demand, the second the foreign one. Summarizing some of these arguments, higher inflation leads to higher nominal interest rates. In a first phase, the latter may not keep pace with inflation, thus real interest rates may fall. But afterwards, if the central bank does not accomodate inflation, the real interest rates are kept much higher than before. Still, too many elements are intertwinned, so that these relationships should be treated with great caution. In absence of central bank reaction, it is for example common that inflation tends to provoke currency devaluation, opening a vicious circle. This is certainly the case with hyperinflation. In fact, in this case, central banks often choose to fix a certain exchange rate target as a nominal anchor in the battle against inflation: with fixed exchange rates, inflation makes import cheaper in comparison to domestic products, so that domestic firms face more intense competition, which should brake inflation. Until the fall in inflation does not takes place, domestic goods become more expensive in a international comparison, typically with a fall in exports and a rise of imports, heavily deteriorationg the trade balance. At the same time, if indexed, local wages and incomes will improve their international purchasing power, thanks to fixed nominal exchange rate. On housing markets and on financial markets of fixed-interest bonds, an increase of inflation will reduce the burden of debt and interest payments. In the case of large public debt, inflation is an important relief for the State (also through larger tax revenues and lower personnel costs), menacing to engender a political tolerance toward inflation. Depending on how painful inflation turns out to be to key social groups and how they ask for institutional changes, it is possible that work contracts includes clauses of automatic or semi-automatic increases of wages to compensate (totally or partially) previous or current inflation (or an agreed "expected" inflation). Also pension benefits, government social expenditure entitlements and other variables can be inflation-adjusted. In political terms, anti-inflationary policies can be popular if the poor and the middle class feel the most of the pain, with the political left usually more prone to lax policies (for fear of an increase of unemployment if conventional anti-inflationary policies are too tough) and the political right getting voted for its position. However, if the actual rise of unemployment gets the attention of the majority of the population (out of direct impact or because of the increase in probability of losing the job, for empathy with sacked members of social networks and in the general population), the left can by contrast get into power. All these dynamics are a far cry from the results of the neoclassical model of consumers, which generates the neutrality of money for real quantities, as you can see demonstrated into this software: try a proportional rise of all prices and income, and you shall see that nothing change (so inflation is irrelevant). The point is that prices do not move proportionally and that income does not automatically follow the same change (because of income distribution dynamics). World-wide inflation has peaked in the '70s, because of two oil crises. Afterwards, inflation has become a major target of public powers and it has been decelerating in most countries. Nonetheless, significant episodes of hyperinflation are still common and many stagnating economies can't take off both because of inflation and anti-inflationary policies. Domestic-based inflation is pro-cyclical, arousing from positive demand conditions and higher wages as it is. External inflationary impulse can begin virtually at any point of domestic business cycle. Imported inflation, if strong enough, is heavily anti-cyclical, since it engenders a fall in output growth. In fact, not only it reduces consumption as every generalized uncompensated price increase, but also it usually prompts requests for compensating higher wages, giving rise to self-propelling cost inflation. These requests are usually only partially accomodated, leaving real incomes lower. Central bank restrictive policies do the rest. A numerical example: if workers at minimum wage are 20% of total workforce in a firm, a necessarily lower percentage will be their payroll on the total (because everybody else is paid more). Let's say, this percentage is 10%. If labour costs are the 50% of total costs, an increase of 10% of minimum wage will be reflected in a 0.5% increase in total costs, the elasticity turning out to be 0.05. Depending on profitability and degree of competition with (similar or heterogeneous) other firms, the business can decide to raise prices or to suffer from a reduction in profitability. If in the market all firms were to have the same labour cost increase, a price increase is the most likely outcome. However, the presence of foreign competitors and of firms that do not employ anybody at the minimum wage would make an asymmetric increase in prices by the abovementioned business a trigger for a painful reduction in sales (to the advantages of the second and third groups of firms), which - if anticipated - would discourage from increasing prices. The choice is also dependent on the business cycle phase: during recovery, the increase of utilization of production capacity boosts profits, which can easily accomodate for minimum wage increases, which macroeconomically increase demand.